Harlequin design and install performance floors and stages, working with stage engineers and theatre consultants in leading venues across the world. 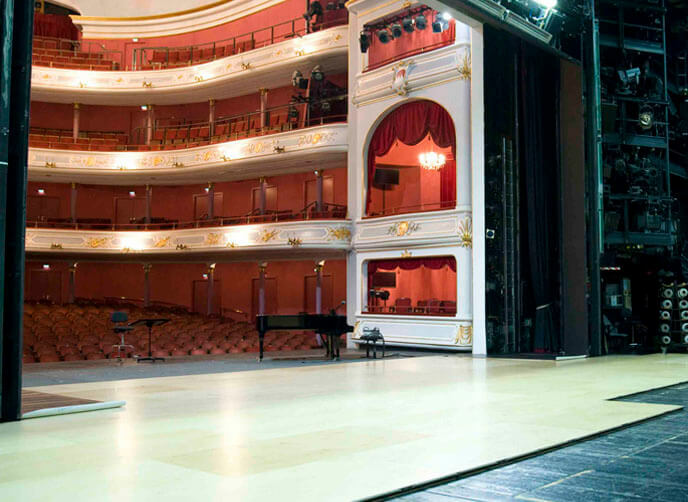 Harlequin’s services include stage building and refurbishment of complete bespoke stage systems, the refurbishment of existing stages and the design and installation of sprung floors and performance surfaces. Theatre professionals demand hard-wearing stages able to withstand fit ups, get outs and the rigging required for every performance. Harlequin products deliver on strength, flexibility and meeting demanding technical requirements such as dip traps, trap doors, ballet wagons and orchestra pit fillers. Harlequin work alongside architects and stage consultants to design, build and install stage floors which will satisfy this need for strength, as well as being easy to maintain and flexible, with the optional inclusion of dip traps, orchestra pit fillers and provision for trap doors or ballet wagons. installation of hardwearing Harlequin Standfast performance vinyl floor, glued and welded to provide a smooth, easy to clean surface. We have been a sponsor of the ABTT (Association of British Theatre Technicians) for over 28 years and exhibit at their annual London show. We are a long-standing sponsor of the Theatres Trust which runs a conference annually in conjunction with the ABTT show. We are a member of PLASA (Professional Lighting and Sound Association) and exhibit at their annual London show as well as their popular ‘Focus’ events in Leeds and Glasgow. "Harlequin Standfast fitted the bill"